Emerald Cut Peridot & Diamond Pendant Sterling Silver Necklace - $27 Shipped! This 1.75 Carat Emerald Cut Peridot and Diamond Estate Styled Pendant in .925 Sterling Silver is selling today for just $27.00 at Szul.com! You will be saving 81% off the regular sale price of $149.00 with this jewelry deal. This price is good through 4/29. 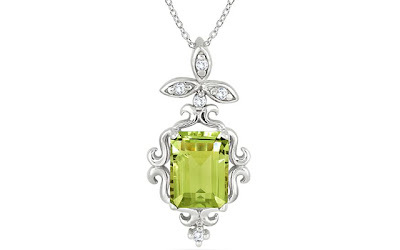 What I like about this peridot necklace is the estate look of the pendant and the color of the emerald-cut stone. The length of the pendant is 22mm and has such an elegant appearance.